Jumping into a hot car, that sticky sunscreen feeling and ridiculous tan lines… yep it is safe to say that summer has well and truly settled in and it is a hot one! 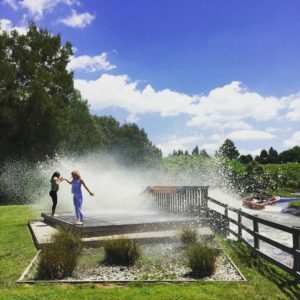 To keep yourself cool and beat the heat we’ve come up with the coolest things to do here in Rotorua, which are also super fun! Obviously the best way to cool yourself down in Rotorua this summer is with an OGO ride! Superman dive into an OGO filled with nice and cool water and choose from our four different tracks! 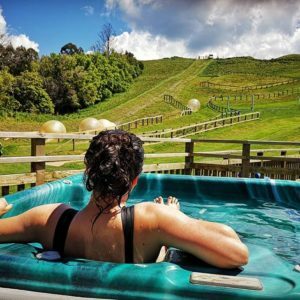 In between rides hang out in our hot tubs (filled with cool water during summer) or relax in the shade in our beanbag hangout zone at the top of the hill while taking in the beautiful views of Lake Rotorua and Mokoia Island. After your OGO ride you will feel refreshed and ready to conquer the rest of your day! Summer would not be summer without ice cream in a cone. Especially when it starts melting before you’ve had a chance to finish and you get sticky fingers. There is only one place in Rotorua to go for ice cream in a cone! 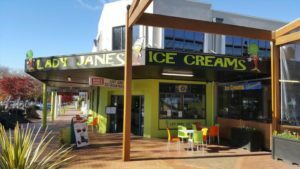 Tucked away on the lake end of Eat Streat is the iconic Lady Janes ice cream parlour. These guys have been serving up delicious treats for the last 30 years! 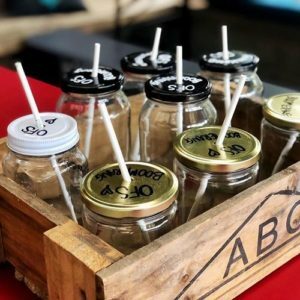 With over 40 different ice cream flavours (including dairy free options) from the Orange Choc chip to the more gourmet Kapiti chocolate and salted caramel with almonds there is something to suit everyone. Located about a 20minute drive out of Rotorua is the Okere Falls Store. These guys are your one stop shop for delicious healthy food and coffee. They also have an extensive vegetarian and vegan offering. Grab one of their healthy smoothies made with all-natural ingredients and enjoy in their beer garden or take your smoothie to go and wander down the Okere Falls walk, a short easy 1.2km walk along the river. If you’re lucky you’ll get to see rafters and kayakers floating along the river. Keep cool and raft down the Kaituna River with our friends River Rats. All safety gear is provided, all you need to do is turn up with your sense of adventure. 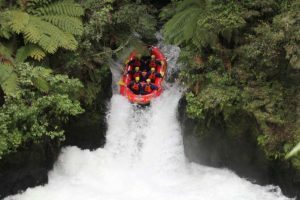 The Kaituna River is definitely one of a kind with a mixture of calm waters, 14 rapids and three waterfalls including the world’s longest commercially rafted waterfall Tutea Falls at 7m long! If you fancy a dip to cool off there is plenty of calm water to float along the river. Perfect for spectators and participants to cool down is the ‘Splash Zone’ at Velocity Valley. Not for the faint hearted, Velocity Valley is located about five minutes down the road from us here at OGO Rotorua. They have a range of five awesome adrenalin activities to choose from including the Agrojet. The Agrojet is the world’s first ever commercial jet sprint on a customised course. If the summer heat has gotten too much you can stand on the deck while the jet boat is going around and prepare to get splashed! Just make sure you bring a spare change of clothes with you!